Make sure you’ve liked our Facebook page to get the “down-low” on where Tinsy is hiding everyday! 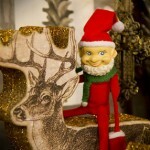 http://www.facebook.com/Laurieshomefurnishings A little extra holiday green in your wallet would be great! Our Annual Mother of all Tent Sales! © 2019 Laurie's Home Furnishings | All rights reserverd. Website designed by Gravity Digital. You will be the first to know about Laurie's Home Tours, Opportunity Buys, Events, and all of the scoop from the store! We promise to keep your email address safe.